The Omnipresent Beauty of the Bossa Nova! Friends, it’s early and the best thing about this moment is I’m talking to you. 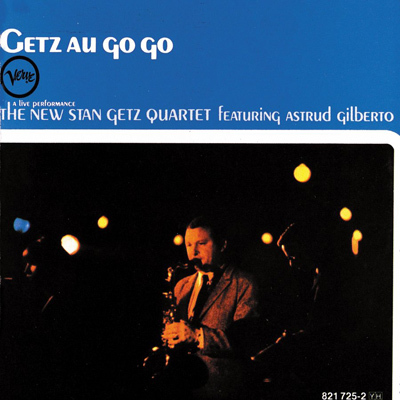 Second best is Stan Getz is supplying the soundtrack and it’s fantastic! 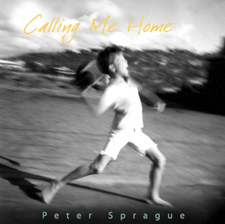 Have you ever heard this recording? We had some great music last week. Wonderful Ki nights with Nina Francis and Leonard that morphed into a classic Sunday afternoon hit with Mundell Lowe at 98 Bottles. 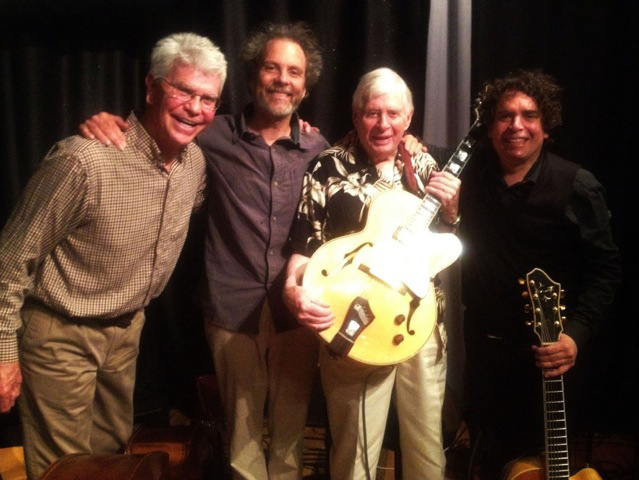 We had the brilliant Howard Alden sit in on guitar, joining Mundell, Bob Magnusson and me. “Blues in the Closet” was the capper complete with all three guitarists soloing at the same time, filling it up, taking it on home. Big fun! 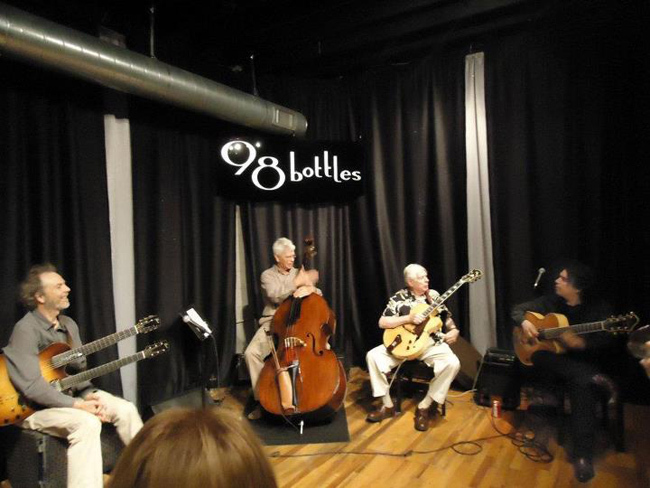 This was the setup at 98 Bottles with Peter on the left, Bob on the bass, Mundell directing traffic in the middle and guest guitarist Howard Alden on the far right. 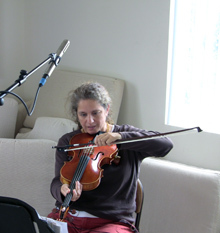 This week we’ve been recording my string group at SpragueLand. We just laid down “Mundaka” and the “Einstein’s Spin” suite is already in the can. It’s sounding good and in a couple of month’s we’ll fly this one into the real world. 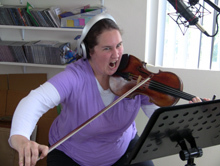 Look out chamber music enthusiasts! Just when you thought it was safe to listen to chamber music, along comes the merry pranksters of the strings! Clowning mode definitely on, that's the terror of the fiddle Bridget on the left, in the middle it's Lars the Romantic of Leucadia showing how it's done, and on the right is Pam the switchfoot of the viola. 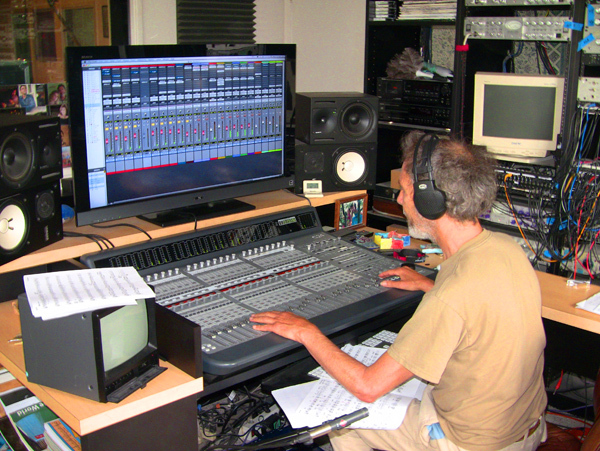 Peter running the board for the string recording session. Lots of buttons and I've even got sheet music in my lap, trying to figure out where we are. It's a lot to do but what a fantastic sonic ride! We played the last notes and now we're posing for a picture. 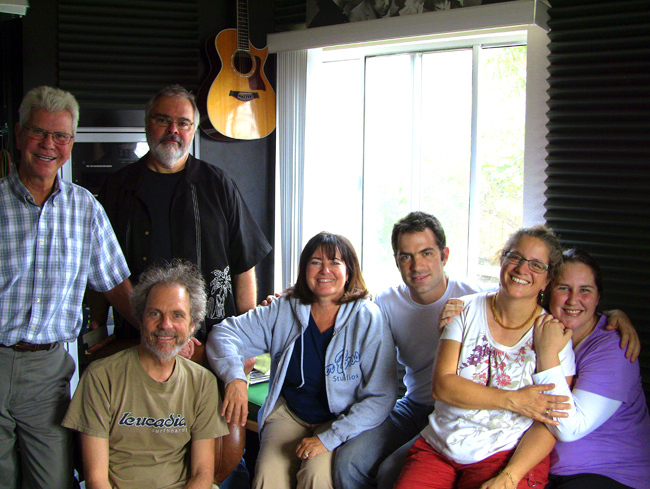 From left to right, Bob, Duncan, Peter, Jeanne, Lars, Pam and Bridget. For this week, first up, the previously advertised concert for tonight at the Rancho Bernardo Library has been cancelled. Mega bummer but there will be more down the road! Also, there won’t be a Roxy gig this Thursday as I’ll be at an event at my daughter’s school as she receives some mysto award for being so cool and smart. That’s my girl! 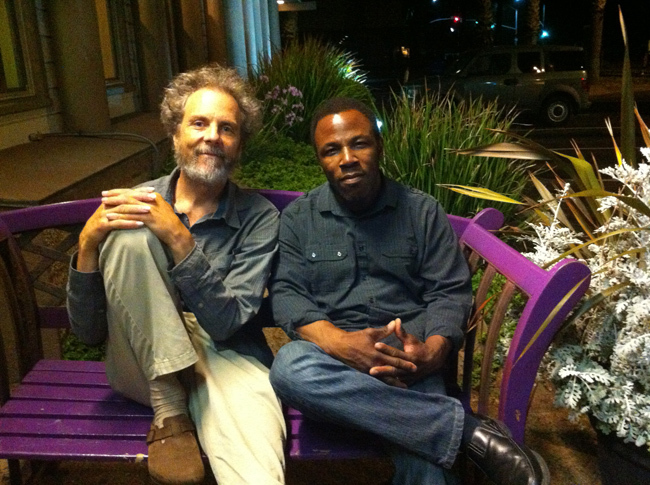 I’m thrilled to be playing two concerts this week with vocalist Leonard Patton. Those who know, know that this dude brings it beautifully night after night. He’s one of my favorites! Last week we rehearsed and learned some new tunes including a wild version of Hendrix’s “Castles Made of Sand”, gone jazz. You’ll hear bebop blending into Stevie Wonder’s “That Girl” and then in the next breath Gilberto Gil’s “Bananiera” makes an appearance. James Taylor is in there too! We hope to see you on Friday night at 98 Bottles on Kettner Boulevard. 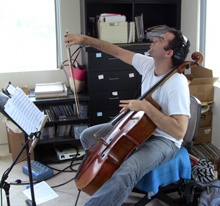 On Saturday night we’re playing a special house concert in the Clairemont Mesa area. Both of these shows are open to everyone so see you there! Peter and Leonard sitting on the magic purple bench at Ki's. Sit on this thing and the options of the world open up!